"Montgomery makes much of the agile, brightly articulated instrument to stake a strong claim for both organ and organist." Choir & Organ March/April 2010"
Acclaimed as a sensitive and rock-solid performer with a delicate, yet commanding use in registering the many colors of the instrument (The American Organist), Scott Montgomery holds an active career in all facets as a musician. 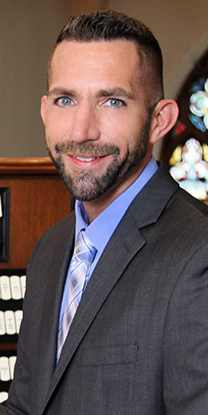 He is currently the Associate Director of Music and Organist for Central United Methodist Church in Fayetteville, Arkansas, a private instructor of piano and organ, and a widely respected concert organist. Scott became nationally recognized in 2006 by winning both the Lilian Murtagh Memorial Award (first-prize) and the Audience Prize of the prestigious American Guild of Organists' National Young Artist Competition in Organ Playing (NYACOP), the first person to win both prizes in the history of the competition. Scott has been a prize winner in several other notable competitions including first-prize in the American Guild of Organists' Region V Competition in Evansville, Indiana (1997), second-prize in the Arthur Poister National Organ Competition in Syracuse, New York (2002), and was also the first recipient of the M. Louise Miller Scholarship (2002) sponsored by the Greater Bridgeport Chapter of the American Guild of organists. Scott is a member of the Concert Artist Cooperative, a roster of national and international concert artists. Scott is widely active as a concert organist throughout the country and abroad. Notable performance venues have included Kimmel Center for the Performing Arts (Philadelphia, PA), Pacific Lutheran University (Tacoma, WA), Ball State University (Muncie, IN), and Heinz Chapel at the University of Pittsburgh (Pittsburgh, PA). He has performed for both regional and national conventions for the American Guild of Organists (AGO), the Organ Historical Society (OHS), National Pastoral Musician Conferences (NPM), and for Pipe Organ Encounters (POE) in the Midwest for both youth and adults. His performances have been broadcast on nationally syndicated radio programs "Pipedreams" and "With Heart and Voice." Scott has produced three critically acclaimed compact disc recordings. Water and Light, released in 2008 by the Pro Organo label, features the tonally resourceful Mander Organ at Peachtree United Methodist Church in Atlanta, Georgia. His second CD, Inspirations From England, released in 2009 by the Regent Record label, featuring the two Mander Organs at St Peter’s Episcopal Church in St Louis, Missouri. Most recently, Scott released his third CD, Organo Plano: Music for a Joyous Occasion, on the Raven label, showcasing the large Reuter Organ at Christ United Methodist Church in Plano, Texas. Scott received his formal training at the University of Illinois, Urbana-Champaign, earning his undergraduate and graduate degrees in organ performance studying with Dr Dana Robinson.